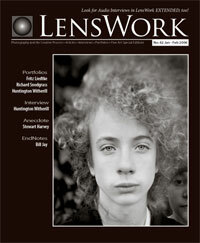 If you love fine photography, especially black and white, you should know about LensWork Magazine. It is, without much competition, one of the finest photography magazines out there, for several reasons. First, the award-winning duotone reproductions are magnificent. Each issue, which comes in its own cardboard envelope, is like a fine art book unto itself. Second, it’s all about photography as a fine art. There’s nothing commercial about it or its articles or portfolios. The only ads are for LensWork’s own products, which are excellent. The essays and interviews are thoughtful reflections on the creative process, as pertains to photography. Third, they only feature the work of 3 photographers per issue, including an introduction to the photographer, a brief essay about the work, and a portfolio of usually 15-20 images. Fourth, Brooks Jensen has a lot of innovative ideas, and runs with them. They produce an extended CD of each issue, including more images from each photographer’s portfolio, audio interviews with the photographers, printable images, extra essays, and other goodies. They publish a few books on photography (I’ve read “On Being a Photographer” by David Hurn and Bill Jay, twice). 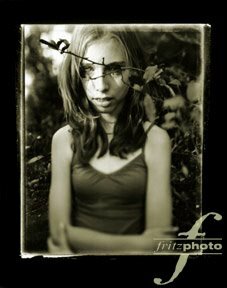 At one time, they had a Special Editions fine art print series, whereby they would faithfully reproduce, on silver gelatin paper, master prints from master photographers. I own one, an image by Wynn Bullock, and it’s magnificent. Fifth, and most important, they published one of my portfolios (“Welcome to Wonderland“) in the Jan/Feb 2006 issue (20 pages, including the cover, above). It’s beautiful. I’d encourage you to browse their site, and even subscribe. All photographs and content is Copyright Fritz Liedtke. Please do not copy or re-use them. To do so is a violation of federal copyright law, and will be prosecuted. Ever since LensWork Magazine published a portfolio of my work in January (issue #62), I’ve discovered, here and there, that other people like my work. They link to it in their blogs. They purchase fine art prints from me. They steal my pictures to use on their websites. And they start discussion groups about my work. While my work, of course, is not all child photography, it is an honor to me to see people congregating around an interest in my photographs. One woman’s work I find especially engaging, as she photographs her own children in haunting, beautiful ways: ‘sweet disten’. Here’s the link. Check it out for yourself. I really do have fans. Now, if they’d just start sending me money, I’d really have it made. Today marks a sad day for me. For the past 4 years, Evie Webb–who happens also to be my youngest sister–has been my main assistant and second shooter. She is always cheerful, bright, and fun to work with. I love her, customers love her. We’d spend hours together at weddings, shooting, running, covering each other. 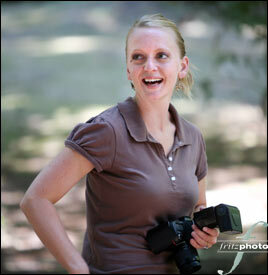 When one of us shot something we were particularly proud of, we’d show the other our LCD screen and laugh together. She was great to travel with too, because, being my sister, we could share a hotel room and it wouldn’t be inappropriate. This morning, bright and early, Evie and her husband James loaded a van with their belongings, and headed to Denver to find their fortune there. We’ll miss you Evie. Your smile will be hard to replace. Katie Jervis Photography - Evie will indeed be missed. What a great gal – wish I’d have had the pleasure of working with her more than twice. Blessings to you, Evie!! Scott Batchelar - As a friend of Fritz I got to meet Evie and sadly I never got the opportunity to work with her but I hope she does really well in Denver and that Fritz can find someone to take her place. Dan Dubay Professional DJ Service - Evie…it was an honor creating special moments together for our past two clients at Youngberg Hill Vineyards. And a treat watching you work. Best to you always. These photos were from a wedding this past July. One of the children, Olivia, who happens to be the daughter of friends, decided she liked my racket. She began shadowing me as I worked the dance floor: she would hold up her disposable camera, crouch down beside me, pretend to fiddle with dials and buttons just as I was, and snap away. I tell you this because, if you come by the studio soon and are greeted by a 5 year old with a plastic Kodak camera in hand, don’t be surprised. Good help is hard to find. N_Zimmer - Fritz, you are one super talented cat! Not to mention, my niece is cute as a button and takes a great photo, lol. Chon - You are talented! I wanna be your protege! Faithful viewers, I know you exist. I know you’re here often. I even know how you get here. Now it’s time to take another step into my world…. I’ve so enjoyed having this outlet to share my work. It’s been an encouragement for me to have work that usually would be seen by a few special people, be seen by many special people. It’s been, along with lots of camping, hiking, and frisbee throwing, one of the things that has really refreshed me this season. Consider this an open invitation to be more than just a viewer: leave a comment! At the end of each post, there’s this little button for doing just that: Comments. Click it, and let me and other visitors know what you think! Join in; be part of the conversation. High school senior portrait photographs can be rather dull and repetetive. That is, if you go to a studio that manufactures them like the Chinese manufacture plastic toys. Would you believe that Stassia actually wears braces? She paid us to remove them, and she looks great without them. Ready for your senior portrait photography session in Portland? Contact us at FritzPhoto, and we’ll have you looking your very best. This past weekend I had the pleasure of photographing Sean and Quin’s wedding, out in Laurel, at the base of Bald Peak, south of Hillsboro, Oregon. My wife grew up on top of Bald Peak, overlooking Gaston, so I know and love the area. 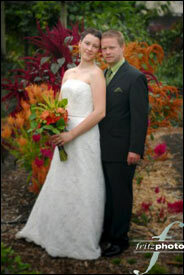 The wedding was held at the Denfeld’s orchards, and it was a beautiful (if hot) day. 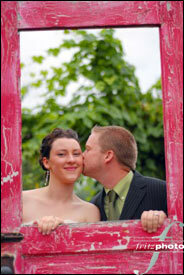 We love being some of the most creative wedding photographers in Portland, Oregon–in the city and in the country. Yesterday, which was a Thursday, I managed to photograph a wedding ceremony, all the family and wedding party photos, and a sweet suite of bride and groom portraits in a single hour. 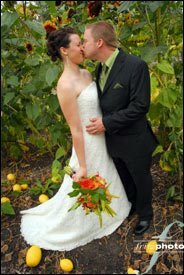 Not only that, but I took my first portraits in a melon patch at the garden of McMenamin’s Edgefield. Fun! This past weekend we had the privilege of photographing Tina and Andrew’s wedding. They were married in what I discovered is the most photogenic Catholic cathedral in Portland: St. Mary’s Cathedral. We took some portraits at the Rose Gardens, and finished the day with an elegant wedding reception at the Governor Hotel’s Grand Ballroom. Andy and Tina were gracious hosts for this lovely day. What an honor to photograph this wedding at such a stunning Portland wedding venue! We’ve spent the summer taking the mud pit we inherited with our hundred-year-old house, and transforming it into an oasis. Now we have grass to lie in, and we spend the summer evenings staring up into the Giant Sequoia towering above us. When the sun is about to set, saturated and golden, we feel as if we are gazing up into a giant Georgia O’Keefe painting. When existing light is not sufficient for proper exposure or desired effect, we turn to artificiallighting. Using the PNCA lighting studio and equipment, we will cover artificial lighting for portraiture, lifestyle, still life, 2D and 3D copy work, fill flash, and on-location lighting. This seven week course utilizes professional lighting equipment, professional models, in-class instruction and oversight, and outside of class access to the studio, to help the student become more confident in creating powerful images using studio lighting. The techniques learned in class provide students with the confidence to use an artificial light source in low light or to add emotion and interest to images in order to further express their vision with both digital and traditional equipment.